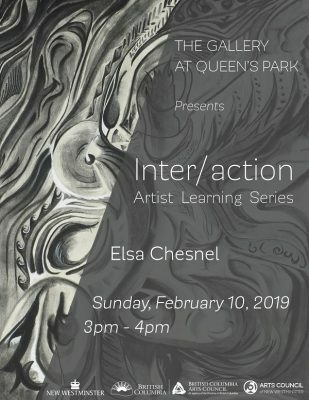 Self-taught in the visual arts, Elsa Chesnel rejected integrating into a French Art School to concentrate on immigrating to Canada. This decade of apparent setback in her artistic growth came back with a vengeance of darkness and colour, sending her staggering toward abstract artwork. She regained her footing remembering Kandinsky’s reckless curves, experimenting with Sonia Delaunay’s bold colours, and discovering Joan Mitchell’s aggressive softness.